Let's see here: Take a Belgian style Dubbel, add smoked malt (inspired by German Rauchbiers), and then age it in American Oak formerly used to age Bourbon. Also, and this is key, don't tell anyone that you're doing it. Seriously, if it weren't for the eternal vigilance of my local beermongers, I probably wouldn't have known this even existed (heck, even they had it tucked away in the back, rather than out on display). To be sure, I've had the regular Otto before, and I have to admit that I found it underwhelming. Belgian style Dubbels are one of my favorite styles, but the smoked malt in Otto overwhelmed any of that great Belgian character, making it a sorta-one-dimensional smokey affair. Of course, that tasting was at a beer club, so conditions weren't entirely ideal, but my opinion doesn't seem to be all that unusual. Even the guy at Pinocchio's agreed with me on that count. I did buy a bottle of the stuff to lay down in my cellar for a while, hoping for the smoked flavors to mellow a bit and maybe harmonize with the Belgian characteristics. 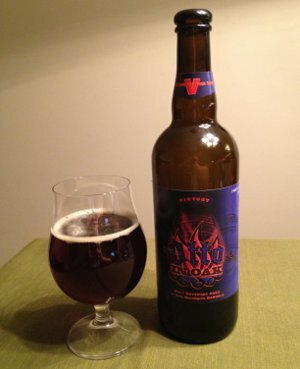 Beer Nerd Details: No ABV listed, but original Otto is 8.1% ABV, so I'm guessing this is a little higher than that. 750 ml caged and corked bottle. Drank out of a goblet on 5/19/12. Bottled on April 26, 2012. Batch #1. From the release dates of Otto (October 15, 2011) and the bottling date on the Otto in Oak, I gather that this has been basking in the glow of Bourbon barrels for around 6 months. I don't know that it's quite as successful as Victory's Dark Intrigue (Bourbon barrel aged Storm King stout), but I do find that I really enjoyed this beer, and I'm really glad I thought to buy an extra one to keep around... And I'm actually heading over to the brewery tomorrow night to meet some friends, so maybe they'll have some of this stuff sitting around. Good to have you back. That's interesting that gilding the dubbel with another layer of flavor managed to bring the dubbel character back out. Although, I guess maybe 6 mos of chillaxing (whether in a barrel, or otherwise) probably helped. It will be interesting to see how your cellared regular Otto tastes. Good to be back! And yeah, I assume the age had something to do with the Belgian character coming through better. Also, as mentioned, the last time I had it was at a beer club tasting, so my palate could have been a bit wonky at the time. This page contains a single entry by Mark published on May 22, 2012 9:28 PM. Philly Beer Week: Iron Hill and Dupont Spéciale Belge was the previous entry in this blog. Hopwired is the next entry in this blog.